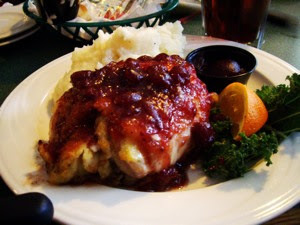 This was the guest of honour, Cape Cod Chicken ($9,99), a stuffed chicken breast, with a generous amount of cranberry (a Cape Cod native) sauce topping, served with mashed potatoes and even more cranberry sauce. A generous portion, and it tasted great. And what to drink, a pint of beer ofcourse! !